The Boston Celtics built their controlling lead back up Friday night as quickly as they had lost it one quarter earlier. It took only two minutes and 33 seconds of game action for the C’s to turn a five-point lead into a 16-point advantage during the third quarter of their 114-93 win over the Mavericks. This run took place just one quarter after Boston’s 17-point lead during the second quarter dropped all the way down to seven at halftime. Three-point possessions keyed the game’s deciding run, as three separate Celtics notched a triple during an 11-0 spurt. The first three-point possession was logged the old-fashioned way by Jaylen Brown. Terry Rozier found Brown, who started in place of the injured Marcus Morris, on a beautiful off-ball cut that led to an and-one bucket. Brown finished a floater in the lane while Wesley Matthews grabbed his waist from behind. Jayson Tatum knocked down Boston’s next basket on a step-back jumper to make it a 10-point game, but that’s not what we’re highlighting here, is it? Let’s get back to the 3s! With 5:27 remaining in the third quarter, Rozier grabbed a defensive rebound and quickly took the ball the length of the court in the opposite direction. As he penetrated the paint, he planted his feet and spun back toward the top of the arc to find Al Horford trailing from behind, unguarded. Again, Rozier hit his teammate, and again, his teammate drained the bucket. Horford’s trey arrived 37 seconds before Tatum got into the act from downtown. Tatum’s 3-pointer arrived after he shed his defender, Harrison Barnes, with a slick shimmy while running a two-man game with Horford. 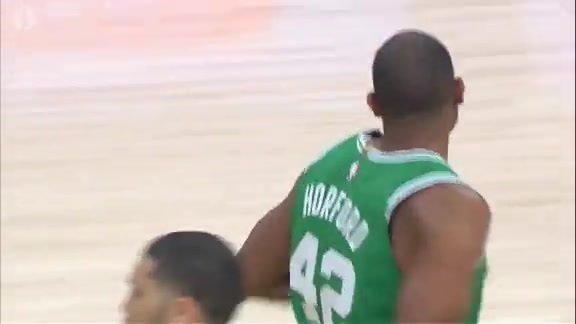 Tatum flipped the ball to Horford, shed his man, and then caught Horford’s scoop pass on the right wing before connecting from long distance. This game was all over after that. Boston’s lead never dropped to single-digits the rest of the night as they cruised to their 13th home victory of the season. Gordon Hayward nearly logged the first triple-double of his career Friday night against the Dallas Mavericks. Two more assists, and he would’ve put a checkmark next to that career accomplishment. 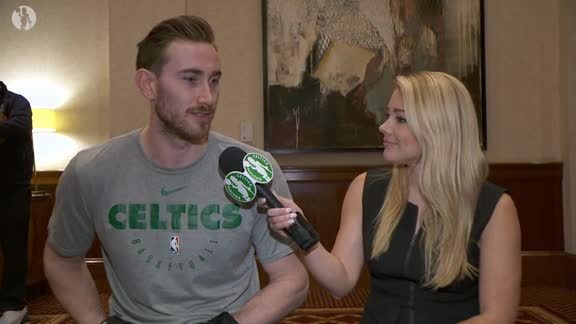 Hayward, who just scored a season-high 35 points during Wednesday night’s win, was outstanding yet again while tallying 16 points, a season-high 11 rebounds and eight assists. He shot 6-for-15 from the field and committed only two turnovers while acting as a primary ball handler for the C’s. Some players might have been seeking out the first triple-double of their career if they were sniffing it during the fourth quarter. Hayward? He probably didn’t even know he was flirting with the feat, let alone have the urge to seek it out. Hayward fell couple of assists shy of his first triple-double while looking like himself for the second straight game. That’s a dangerous development for the rest of the league. Five Celtics scored in double-figures, including four starters. Jaylen Brown led the game with 21 points. Harrison Barnes led Dallas with 20 points. In what may be his last game inside TD Garden, Dirk Nowitzki shot 0-for-10 from the field. Gordon Hayward (16 points, 11 rebounds, eight assists) and Al Horford (10 points, eight rebounds, eight assists) flirted with triple-doubles. The Celtics tallied 35 assists compared to just 12 turnovers. Three Mavs reserves finished with plus/minus ratings of at least minus-22. Despite having two normal reserves in the starting lineup, Boston's bench outscored Dallas' 40-22. Daniel Theis grabbed a team-best 13 rebounds. DeAndre Jordan grabbed a game-high 15 boards. Brad Wanamaker tallied eight points, four assists, three steals and two rebounds 22 minutes of action. Four Celtics (Wanamaker, Terry Rozier, Theis and Semi Ojeleye) each scored eight points. Boston limited Dallas to just 38.6 percent shooting from the field and 25 percent shooting from long range. No question. I've rooted for the opponent to score two times in my life: Paul Pierce and Dirk Nowitzki. Brad Stevens on if he was rooting for Dirk to score.